We've been compiling some amazing Porsche models on eBay for nearly three years now, and we've seen some pretty astonishing cars pop up now and again. This week we're focusing solely on some of our favorite rare paint and beautiful Porsche paint colors, including some paint to sample shades. Hopefully you've enjoyed our curated look at the Porsche market. Keep in mind, some of these Porsches could be great collection investments, while others might prove to do more financial harm than good. It goes without saying that a 918 Spyder is an incredibly cool car, and worthy of adding to your collection if you can swing it. The fact that this particular model was fitted with both the Weissach performance package as well as a gorgeously subdued special order paint color makes this an incredibly rare car, and one that could outstrip values of many other cars like it. Usually, when people order a paint to sample shade, they choose something flashy and bright. Resale on something like that will be impacted, as many supercar owners prefer their ostentatious car to be painted a more subtle color. No, it won't blend in to the crowd, but it'll certainly be less eye searing. Meteor Grey isn't a terribly rare color, but this color way was certainly one of the lower optioned ones for the Transsyberia, and I vastly prefer it to the orange-over-black examples. The Transsyberia is a perfectly acceptable way to buy a Cayenne, especially if you're going to at least do a little fire-road two-tracking in it. Take this beastly Porsche for a few over-the-river-and-through-the-woods adventures, you won't regret it. There is something intoxicating about an early narrow-body impact bumper car with chrome/polished trim and Ice Green paint. I've seen a few of these in my life, and they always take my breath away. It's such an attractive color in person, especially in direct sunlight, and it works so well on the narrow flanks of this 1976 model. This car has been treated to what looks like a full restoration in recent years, including a full engine overhaul, and fresh brakes, tires, windshield, and rubber trim. If all of the receipts prove that to be true, this car's $60,000 buy-it-now listing seems almost fair. Alleged to be one of only three examples built in this color combination, this already rare and valuable 3.3L 964 Turbo becomes a blue-over-linen rarity worthy of inclusion in this list. This Tahoe Blue paint looks to be in great shape, and really separates this car from the crowd. 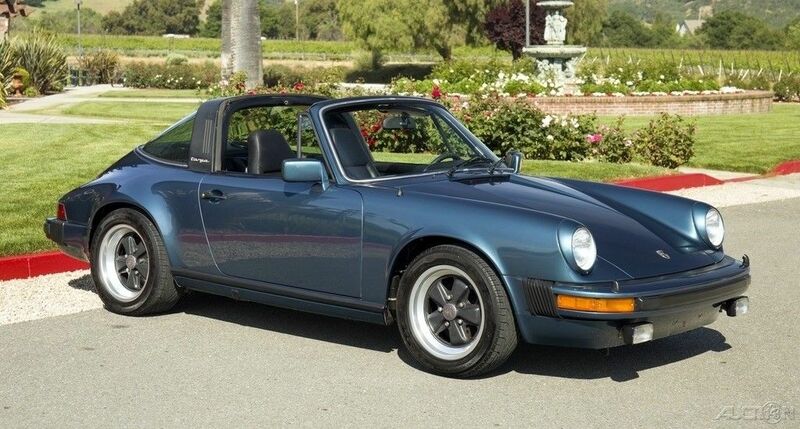 It's a particularly fetching shade of blue, a color that already works well on the 964 shape. This car was almost 120,000 dollars in 1991, including a whole lot of leather covered switch gear, as well as a bunch of custom wood covered interior components. Definitely worth adding to a collection of special color Porsches. This car is stated to be all original, with only 78,000 miles on the odometer, having been garaged since new. This SC features rare paint, sport seats, and an opening top, making it a great weekend cruiser. This looks to have been well cared for, and is probably an absolute hoot to drive. Take it for a spin on a local fast road with the top out, and you'll fall in love instantly. Besides, that gorgeous deep blue paint is worth the cost of entry in and of itself. Very surprised to see the periscopes on a SC model. Is it an Euro model? Why surprised? The Super Carrera prices have soared in the last 6 years. #2 cars are in the $40k plus range and #1 cars are close to $60k range. It was an option on US cars, if not a very common one. Those thingies on the front bumper – I’m guessing headlight washers and not deer whistles? I had a ’74 911 in Ice Green Metallic during late ’80s/early ’90s. In person, the color is much brighter than in pictures………it really was stunning. I eventually sold it to a local indy mechanic, who has since stripped out and painted the entire interior white, and converted it into a dedicated Autocross/DE car. Sad, the ice green color 911 is absolutely classic. We had a ‘74 Targa for about 30 years and our son now owns it and plans to pass it on to his 4 year old daughter when she is old enough. A much better legacy for such a special automobile.